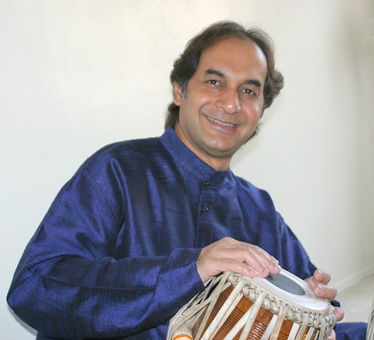 Arup Chattopadhyay is recognized today as one of the outstanding tabla artists of the younger generation. As a premier disciple of the world renowned maestro Pandit Shankar Ghosh of the Farukabadh gharana (style) of tabla, Arup has established himself both as an accompanist and soloist. Arup started his initial training in tabla at the age of six from his father, the eminent tabla player, Shri Pankaj Chattopadhyay and later came under the tutelage of Pandit Shankar Ghosh with whom he continues to train. An affiliated tabla artist with the All India Radio and Doordarshan Televison, Arup records and performs frequently for the Indian broadcasting network. He has accompanied some of the leading musicians of India such as Pandit Ravi Shankar, Rajan and Sajan Mishra, V.G. Jog, Ashish Khan, Ajoy Chakravorty, Vishwa Mohan Bhatt and Kartik Seshadri. Since 1997, he has toured extensively with sitarist Kartik Seshadri in performances throughout the United States, Canada and India.